More than 10 percent of House members have now announced they will protest rather than celebrate on Inauguration Day. My absence is not motivated by disrespect for the office or motivated by disrespect for the government that we have in this great democracy, but as an individual act—yes, of defiance, at the disrespect shown to millions and millions of Americans by this incoming administration and by the actions we are taking in this Congress. Trump’s goals are far less lofty.The president-elect just wants an Inauguration Day crowd that fosters fantasies of unity and popular support. Trump needs official acceptance to sustain the dubious claim that he has a mandate to govern. With more than ten percent of House members declaring that they will not participate in the inaugural ceremonies, Trump is being denied the image of mass approval that he so desperately desires. House Democrats are steering energy and attention away from the inauguration and toward protests, which many of them will join, against a president who lost the popular vote but continues to promote extreme policies and nominees. In the weeks that followed, a few more House members joined the boycott. Massachusetts Congresswoman Katherine Clark explained that “I do not feel that I can contribute to the normalization of the President-elect’s divisive rhetoric by participating in the Inauguration,” while California Congressman Jared Huffman said that “with Donald Trump as our President, the United States is entering a dark and very dangerous political chapter. I will do everything I can to limit the damage and the duration of this chapter, and I believe we can get through it. But I will not sit passively and politely applaud as it begins.” Oregon Congressman Earl Blumenauer, a leading environmental advocate, added his name to the not-going-there list, as did former Congressional Hispanic Caucus chair Nydia Velazquez, D-New York. Congressman John Conyers, the senior member of the House and the ranking Democratic member of the House Judiciary Committee, joined that resistance with an announcement that he, too, would boycott the inaugural. Trump confirmed the power of the boycott by reacting with vitriol and scorn toward Lewis, an iconic figure in American public life whom Democrats and Republicans have long recognized as a voice of moral authority. 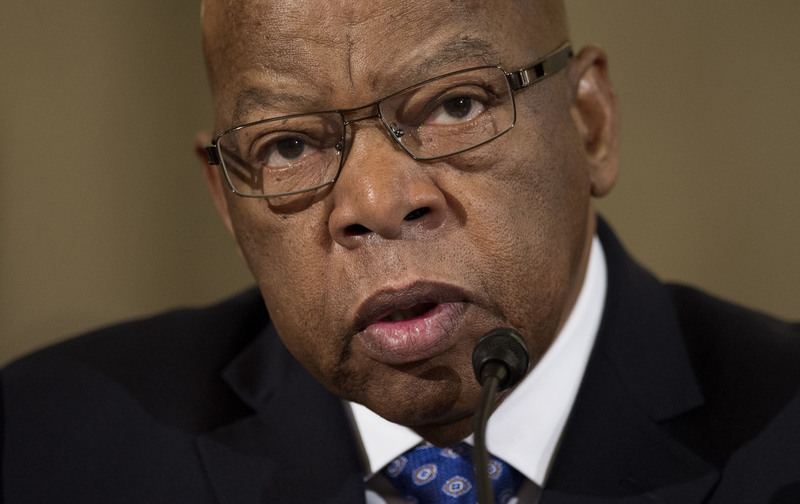 Trump’s tweets attacking Lewis inspired more members of Congress to join the boycott. Noting that Trump had accused Lewis, who was severely beaten during the civil-rights marches of the 1960s, of being “all talk,” California Congressman Mark Takano tweeted a historic photo of Lewis with Dr. King. “I stand with @repjohnlewis and I will not be attending the inauguration,” wrote the Californian. Referencing Trump’s attack on Lewis, Wisconsin Congressman Mark Pocan, the vice chair of the Congressional Progressive Caucus, announced that he would not attend the inaugural ceremony. “It’s time for Donald Trump to start acting like President Trump, not an immature, undignified reality star with questionable friends and a Twitter addiction,” said Pocan. The resistance to Trump will take many forms and come from many corners. It will be an inside-outside movement that combines congressional objections with grassroots protests. But it will have at its core an understanding expressed by Congressional Progressive Caucus co-chair Keith Ellison, a leading contender for chairman of the Democratic National Committee, when he announced he was joining the boycott.